If you like Colorado...and cowboys...and riveting, fully-developed characters in the vein of Maisey Yates, then this is your series. Right now, it's my series. I'm brand-spanking new to the Sara Richardson club, but halfway through this book, I ordered the first two books in this series and pre-ordered the fourth, which isn't even out until this summer. I want to read a story about every one of the characters I met; and falling in love with Levi Cortez, the book's hero, was like falling off a log. He. Is. DARLING. The heroine, Cassidy Greer, is the type of heroine I'd want to be BFFs with, with the kind of problems and strength of overcoming them that I could relate to. I cannot wait to read the rest of the Colorado series - and especially cannot wait to see who Matteo Torres falls for. But that will clearly be another book. 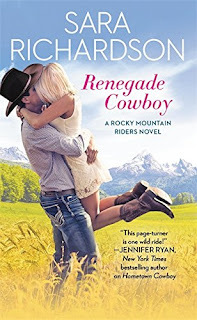 In RENEGADE COWBOY, Cassidy Greer has a plan - and her plan does not include good looking cowboys like Levi Cortez, regardless if he's offering a long or short affair, her choice. She needs to make sure her mother will be fine as Cassidy goes to Denver for a residency as a pediatric nurse. It's all she's wanted; she's been waiting six years to do this - and she does not have time to be seduced by Levi, even if he is the hottest thing since ghost peppers. Unfortunately, her mother may ruin her plans, with or without the interference of Levi. When Cassidy's brother Cash died six years ago, her mother never got over it. Her mother lost her son, her husband, and now is slowly losing her mind as she drinks to forget. Cassidy can't leave her alcoholic mother alone; and there is no one else to take care of her. As much as she wants the residency, she fears she'll never be able to leave Topaz Falls. Of course, her mother, Lulu, doesn't want Cassidy to give up her dreams because of her drinking problem; and Lulu struggles to overcome her alcoholism, but fails repeatedly. Cassidy is supported by her best friends, Jessa and Naomi, as well as their husbands Lance and Lucas, Levi's older brothers, but she doesn't want to lean on them or Levi too heavily. Loss is a funny, difficult think, and asking for help isn't something Cassidy does well. Still, Levi perseveres and eventually it all works out in a happily ever after. Some critics (and cynics) may point out that Levi is too good to be true, and yes, but isn't that why we read romance novels? And when you find the person you love with all your heart, don't you too pull out all the stops to show it? Maybe it's not entirely fictional. And the critics and cynics may also point out that Lulu's alcoholism and the issues that entails cannot be fixed as easily as a romance may resolve, but again, Richardson did deal with the treatment in a way in which Lulu didn't just give up cold turkey and never touch it again - which would have been more unrealistic. The story ends on more of a happily ever after for now - and Richardson's core story seems to be about living and loving in the present because the future is never promised. To me, that felt more real than the average romance. And, as I said in the beginning, I can't wait to read the others in this series. This was a total Top Dish for me. This sounds like my kind of book, Hellie. I'll have to check it out. Your enthusiasm is always contagious. Not unlike my laughter. *LOL* And more preferably contagious than the flu. :) Hope you like it! Personally, I like heroes that are too good to be true. That's why it's called fiction! This one sounds great! Ha! Me too! I love my share of bad boys, but more and more I'm like, "God, I really like the nice guy...he's really just a nice guy!" --so good they're getting their share of the fiction! I've never read her but I look forward to reading this book. We are reading fiction. Thanks, Hellie! You've made me want to go buy this series too. Like you, I do love a (fictional) bad boy but I love seeing the nice guys getting their happy endings too. This sounds like a story I'll enjoy. Thanks for the review. I disagree with the cynics. There really are too good to be true guys out there. It is just that we aren't all lucky enough to find them. I did, long before I discovered romance novels. I will have to look for this series. It sounds like it deals with issues many have to deal with in real life.